At the table, Tash, Farid, and Emma are deciding what to do for their next game. 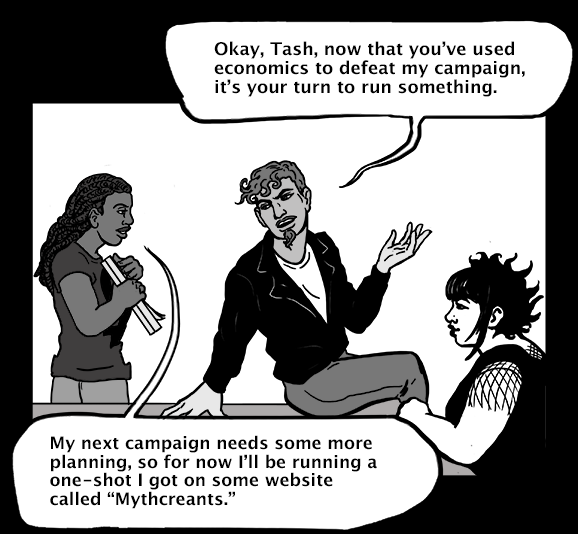 Farid: Okay, Tash, now that you’ve used economics to defeat my campaign, it’s your turn to run something. Tash shows Emma and Tash the Voyage cover page on her laptop. 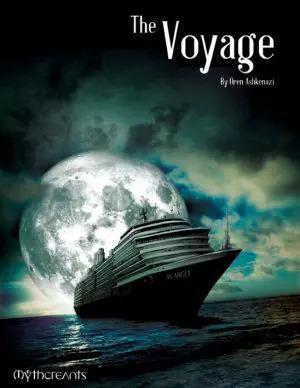 Emma: The Voyage? 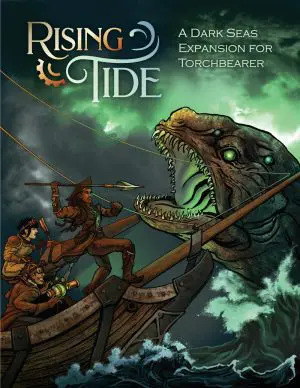 It’s a creepy boat game? Tash: Take your character sheets and find out. In the game, Farid and Emma wake up in a spooky ritual chamber aboard a ship. Emma is wearing a badass leather jacket, Farid has a bood stained ritual robe, and there’s a dead body on the floor. Tash speaks in a voice over. Tash: You wake up on the observation deck of a ship, with no idea who you are or how you came to be here. Emma: Oooh, some kind of spooky ritual, I like it. At the table, Farid looks at his blank character sheet. Faird: I think there’s been a mistake, our sheets are blank. Tash: That’s right. You don’t know who you are or what you can do. Farid: Then how do I know how many dice to roll? Tash: Try to do something and I’ll tell you. Emma: Ok, I try magic. In the game, Emma waves her hands trying to summon magic, while tatoo covered Farid gives her a look. Farid: Really? You think you’re the magic one? Emma: WHERE ARE MY DICE! Does this mean that Oren is an official part of the Roll Dice Already extended universe? The deep canon runs to strange and unexpected places! Very strange and very unexpected. More of this, please. Yay, glad you like it Sir Cay! This run will be going for at least the next couple months, depending on how long it takes us to get Rising Tide out. Ooh, sounds like this will be very interesting. I like spooky mysteries, but I always get disappointed when the supernatural element turns out to be fake. I feel cheated when that happens, and it’s happened way too often for my liking. Weird considering that I liked Scooby-Doo as a kid. Maybe one day I’ll write a mystery story that goes headfirst into the supernatural…when I don’t have two books on the go simultaneously! Fortunately I can confirm that the magic is real in this story!